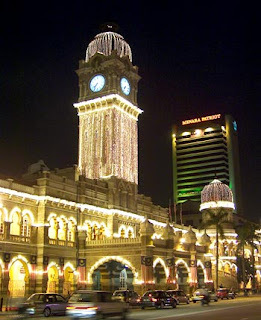 Prior to the building of the Petronas Twin Towers, the Sultan Abdul Samad building has long been a famous landmark for Malaysia and Kuala Lumpur. Designed by British architect A.C Norman, it was built in 1897 with a unique Moorish-style design. The Moorish inspired design of the building is based on some of the features of buildings in Islamic countries that suitably reflects the cultural background of Malaysia. It used to be the Colonial Secretariat offices, but now houses the Supreme and High Courts. The centre of attraction of Sultan Abdul Samad is it’s clock tower in the midle – Kuala Lumpur‘s answer to London’s ‘Big Ben’. The clock tower is significant to many major events; from the lowering of the Union Jack at the strock of midnite when Malaysia (then Malaya) gained independance to the numorous new year eve celebrations. A must visit in Kuala Lumpur!